A little nostalgia for the new readers. This was my first post as The Peanut Butter Boy over 2 years ago and I wanted to refresh the recipe since I made them recently and they are even better than I remember. These protein bars are sweet and chewy and much better then the overpriced, sugar-laced protein bars you find at the store. I tried many recipes but didn’t care for most of them and the nutrient ratio wasn’t optimal. I finally decided to concoct my own. These bars are so chewy and are truly like candy bars but they are also a filling and balanced snack and a great way to increase your protein intake. But even if you don’t need the extra protein, these are a great midday snack or dessert. You can mix and match the flavor depending on the flavors of protein and pudding mix you choose, I’ve included a few variations. Don’t be put off by the length of the instructions, they don’t take much time at all to prepare. * Do NOT use soy protein, it will not work! I use Optimum Nutrition 100% Natural Whey Protein. 1. Line the inside of a 5 x 7 (or 6 x 6) glass baking dish with wax paper (9 x 13 dish works but you may want to double the recipe or they will be very thin). Coat the wax paper with cooking spray. 2. Mix the dry ingredients together in a large bowl. Add the peanut butter and use a knife to cut it into the mix until there are only small chunks of peanut butter remaining. Slowly add the milk and stir until well mixed and the batter is moist and very sticky, making it almost impossible to stir (the stickier, the better). Don’t add too much milk or it will become runny – I found 1/2 cup milk to be just about perfect unless using chocolate protein or chocolate pudding (3/4 cup for this) but it also depends on your protein. 3. Use a wooden spoon to spread out and flatten the mixture as best possible. If necessary, use another sheet of wax coated in cooking spray around your hand to press the mixture into the dish. Cover the top with wheat bran (~1/2 cup) and press it into the mixture until there are no sticky spots (excess wheat bran is fine). Pop the dish in the freezer for 30 minutes. 4. Now, pull the mixture out of the dish by lifting the sides of the wax paper and turn it upside-down into the dish so the wheat bran covered side is on the bottom. Slowly remove the wax paper. If this is too difficult, place the dish in the freezer for a little while longer. Cover the top with wheat bran again and press it into the mixture. Cut into 12 pieces and use the extra wheat bran in the dish to coat all sides of the bars. Individually wrap each bar in wax paper and store in the fridge or freezer. While these bars do need to be stored in the fridge or freezer, they hold well throughout the day at room temperature and are great for on-the-go snacks. They should keep well for at least a week in the refrigerator and at least 1 month in the freezer. I made the butterscotch one. It is awesome. I used Butterscotch pudding instead of vanilla. It appears that I incorrectly wrote the pudding flavors. They should be cheesecake flavored and butterscotch flavored pudding. But yes! They are delicious! I used another piece of sprayed wax paper to press the batter into the pan. It helped make nice even bars and didn’t stick. Great recipe. Thanks. these might sound like silly questions, but you call for “2T natural peanut butter”. First of all, what does the “T” stand for?–tablespoon? And Second, where do you get natural peanut butter–is this the same thing the grocery store sells? Like JIF? Did I not reply to this one? “T” is tablespoon, “t” is teaspoon. Also, natural peanut butters you can often find in the store. The way to tell is by looking at the ingredients, it should only contain “peanuts” and optionally “salt”. In addition, with natural peanut butter the oil separates and floats on top. I believe Jif makes a natural peanut butter but they add sugar which just covers up the peanut taste and a lot of new “natural” peanut butters have palm oil added so the oil doesn’t separate. Smucker’s makes a decent one that’s usually found in stores or try Trader Joe’s or Whole Foods if you can’t find a natural pb in your grocery store. Fun nostalgia :) And great recipe! Sounds delicious! I bet they would be amazing with Sun Warrior Protein, vanilla is my favorite. Ooo and adding chocolate chips would be even more delicious! Excellent idea! Most proteins should work fine you’ll just need to play with the liquids, just add the milk slowly. ohhh ok I’m so in on this one. Those look super. 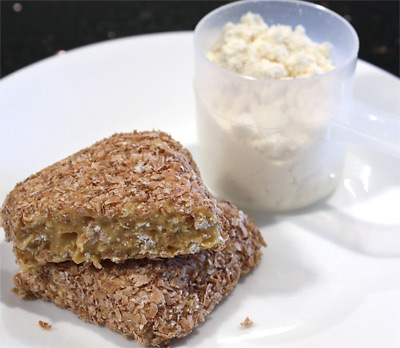 My version of this type of protein rich treat has far less ingredients but is no where near as thick and rich looking. Yum! Yea there are some simple recipes out there, including the good old protein shake, but these are much more satisfying! These look really good. I actually invented a bar almost identical to this last week, except mine didn’t look as good as I didn’t put in any peanut butter or pudding mix. I used bananas and pumpking instead. Your’s look better, I’ll try them out. I found PB Loco products at Whole Foods last week! I bougth the Cookie dough flavor–it was good, but it wasn’t as epic as I had hoped. More White Chocolate Wonderful and natural PB for me! That sounds good but I bet the bananas and pumpkin made it a lot runnier. Perhaps some kind of a combo like using pumpkin in place of some of the milk in this recipe. i’m totally digging this :) will def try, thanks for reposting!! These sound great! Especially the strawberry cheesecake. Beats a granola bar any day! youre thankful for peanut butter yes? want me to write you a rhyming ode to the stuff? GREAT recipe! I revamped it a little for myself and posted the recipe on my blog with a link to the original. Thanks for the inspiration! I like your version but I didn’t think it would work with almond milk, very cool. I know soy milk doesn’t work with pudding mix (it doesn’t firm up) but it’s great to know that almond milk does. It looks a bit dry though, is it? The almond milk seemed to work just fine for me! I gave up using a spoon to stir it, though, and ended up just digging in with my hands! I does look dry in the pictures, but actually it was really rich and chewy – reminded of me of a cross between under-cooked brownies (my favorite) and fudge. Next time I’ll put them in an air-tight container instead of just individually wrapped – the edges start to dry out a just little after a couple days in the fridge. My trick is to individually wrap them in wax paper and keep them all in a sealed bag or container. They still get dry on the edges after a few days though. That banana pudding is the best flavor in my mind but I forget how it waste in the protein bars. Can’t imagine it would be bad though, enjoy! This recipe looks very nice. I have three questions though. Would it be possible to make a peanut butter protein candy bar? Is there a fat-free peanut butter pudding? Is it possible to substitute the vanilla pudding for something like fat-free cream cheese cheese that would have a more subtle flavor? Well all the recipes have peanut butter in it, but I agree, a peanut butter one would be better! I haven’t seen a peanut butter pudding mix before, but you could probably find a recipe for homemade PB pudding or use some unflavored gelatin and peanut flour plus sugar/sweetener. I don’t know what ingredient makes instant pudding thick, but I think the gelatin could replace it so you can go nuts with the peanut butter =). Let me know if you give it a shot! What is that on the side? A cream Milkshake? Haha, no, that’s just the protein powder by itself in a measuring cup! Mix all together in a bowl and flatten out to make 6 bars. Thanks Tyler! I love hearing from people that enjoy my recipes, that’s why I do this! I must say – that recipe looks oddly similar to the recipe I just posted a few weeks ago: Gluten-Free Peanut Butter Granola Bars. However, I’ve been toying with the idea of going 100% oats and eliminating the rice krispies. I’ll try it out next time, thanks! Awesome man! Glad you like them! I wish more people would make this recipe because they are so much tastier, healthier and cheaper than the pre-packaged ones. Keep trying out new combos – if you discover anything tasty, let me know!